which is a teaching division of the Faculty of Physics of Moscow State University by M.V.Lomonosov. 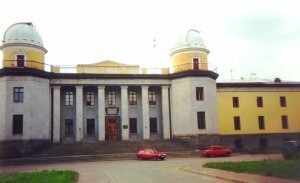 ApSA is situated at Sternberg Astronomical Institute, which is a scientific research institute in Moscow State University. Next current meeting of ApSA staff will be held 18 Apr 2001 in the Conference Hall at 17.00. Agenda. General information - report on activity in 1995-1999. Proposed research projects for students. Other astronomical organizations in Russia.